The Original Hot Candy Powder Orange Flavor by Diana. Pico Diana is a oranged flavored hot candy powder that is deliciously sweet and spicy. This product comes in small packets that can be eaten just like that or sprinkled onto to fruits which makes for a much tastier treat. Pico candy powder is so good, its like having a spicy party in your mouth. Ingredients: salt, citric acid, dextrose, corn syrup, chili powder, silicon dioxide, tricalcium phosphate, artificial flavor and artificial colors. El Original Dulce en Polvo Picoso con sabor a naranja marca Diana. 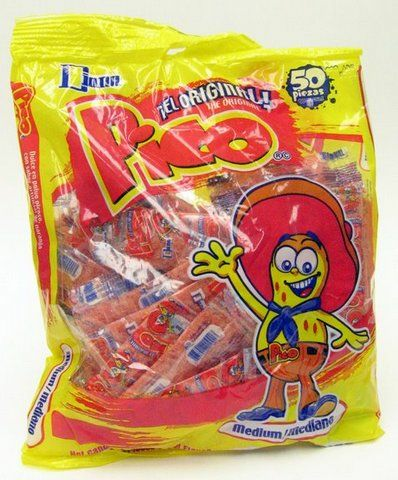 Pico Diana es un dulce en polvo picoso con sabor a naranja, que es deliciosamente dulce y enchiloso. Este producto viene con bolsitas chicas que contiene el polvito dulce y que puede ser comido asi directamente o rociado encima de frutas que es como mas rico sabe. El polvo dulce "Pico" es tan sabroso que es como tener una fiesta picosa en tu boca. Ingredientes: azucar, sal, acido citrico, dextrosa, glucosa, chile en polvo, dioxido de silicio, fosfato tricalcico, saborizante artificial y colorantes artificiales. I'm in NY so it's awesome I can get the candy I grew up eating! Love this candy and Love that you carry it!! This was my favorite candy as a kid and it is still ridiculously delicious and addictive! It's the perfect combination of salty, sweet, spicy goodness. I love it and can't get enough. I love Pico Diana Candy and it is great for traveling since it comes in small individual packages.